Find Out More About the Newest in Vapor Barrier Hose Technology and How to Reduce Fuel Loss By 90-99%! 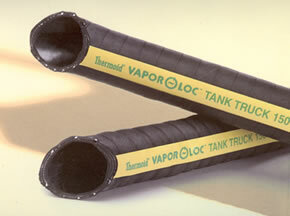 With its unique, multi-layered permeation barrier system, VAPOR-LOC Tank Truck Hose is unlike any other bulk transport hose product available, today. Through the use of this exclusive VAPOR-LOC manufacturing process, this hose dramatically reduces atmospheric petroleum emissions, reduces fuel lost through permeation and virtually eliminates smelly fuel odors and more. This hose is rated at full vacuum. It provides a constant working pressure of 150 and/or 200 psi. It is exceptionally lightweight, very flexible and handles easily. This hose is ideal for use in rough, outdoor conditions. VAPOR-LOC Tank Truck Hose is highly recommended for use with most petroleum products, various types of fats/oils, hydraulic fluids and some chemicals. 200 psi, Vacuum Rating - Full (30"Hg) -- 1"- 1-1/4" I.D. 50psi, Vacuum Rating - Full (30" Hg) -- 1-1/2"-4" I.D. This chart demonstrates just how effective the barrier VAPOR-LOC process is in stopping fuel vapor permeation. Shown are the test results of the amount of fuel vapor in grams per day lost for two gasoline fuel types (see chart) over a forty day period in a side by side comparison of our 2" I.D. Transporter VAPOR-LOC Tank Truck Hose versus seven other identical size fuel tank truck hose products available from competitive sources. VAPOR-LOC ... the newest, most innovative and cost effective hydrocarbon fuel vapor barrier hose technology available, today. The exclusive VAPOR-LOC multi-layering manufacturing process (patent pending) virtually traps and prevents hydrocarbon fuel vapors from permeating through the hose. 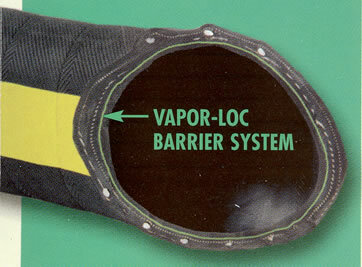 As shown in the hose illustration above, the VAPOR-LOC manufacturing process integrates a multi-layer vapor resistant barrier between the hose's components virtually locking in the hydrocarbon fuel vapors that would normally permeate through a traditional hose construction. Thermoid's VAPOR-LOC process will be made available on other fuel hoses, making these the best fuel saving and environmentally effective hose products on the market. The reduction of hydrocarbon pollution emissions into the atmosphere, improved use of available fuel resources and the overall fuel cost savings created by the use of hoses with our VAPOR-LOC process will benefit everyone. 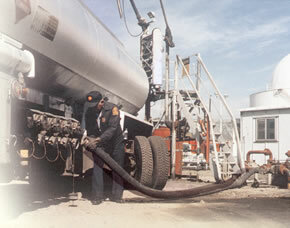 * SIGMA 2006 STATISTICAL REPORT - Members' Operations, Sales and Service during 2005; Published by Society of Independent Gasoline Marketers of America - 02/2006. ** THE BIG WASTE - Research study published by Dr. Mark Deluchi & Associates - University of California (Berkeley, CA); Information reprinted from Crude Awakening: The Oil Mess in Americas, Jack Doyle/Friends of the Earth, Washington, D.C. -1994.